FAQs / How do I look up the Error Log for the EZRentOut QuickBooks Desktop Sync Utility? If you are using a QuickBooks Desktop Sync Utility earlier than Version 3.1, here is what you should do to look up the Error Log. 2) View ‘Hidden Items’. Depending on your Windows version, the Hidden Items options might be a little different. 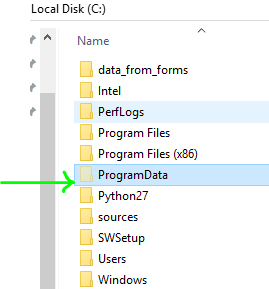 3) In the Program Data Folder, find the Log file. 2) In the EZRentOut folder, Log files will show up for each month. They will follow the format below, with ‘201807log.txt’ standing for the July 2018 Log file, for example. As you can see, you can now also see specific Error Reports here as well.